Ultimate Vortex Generator & Tiny ScienceNew! 8 years & up. 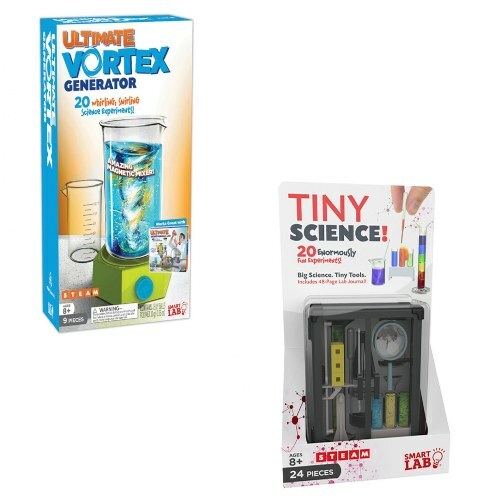 Young scientists can conduct whirling, swirling chemistry experiments with the Ultimate Vortex Generator and use tiny tools for big science experiments with Tiny Science! The spinning magnetic mixer creates a tornado in a beaker and includes an activity book with 20 experiments that explore STEM concepts. Mix up tiny chemistry experiments with the miniature science kit using itty-bitty beakers, test tubes, and flasks. Observe tiny specimens through the teeny-tiny magnifier. The science activity book included with this tiny set features 20 experiments and the science behind them to promote STEAM concepts.